দেশের মাটিতে পা দিয়েই আঁচ করতে পেরেছিলাম ঝড়ের পূর্বাভাস। দেখলাম রাজনৈতিক আকাশের ঈশানকোণে জমে উঠেছে কালো মেঘ। ক্রমান্বয়ে খালেদার সরকার দুর্বল হয়ে পড়ছে। একই মাত্রায় খালেদা জিয়ার ব্যক্তিগত জনপ্রিয়তায় ধস এবং রাষ্ট্র পরিচালনার ক্ষেত্রে যোগ্যতা ও স্বচ্ছতার ব্যাপারে প্রশ্ন দেখা দিয়েছে। হতাশাগ্রস্ত দেশবাসী! I returned to the country along with my family. After a long imposed exile life abroad I was trying to settle down at the same time was acquiring the knowledge about the on going over all flow of events on ground. I decided to lead a humble life not being dependant on anyone but independently on my own efforts. Many well wishers had assured to help and assist in my rehabilitation process. Bappi, my brother in law had already started about a year back building multi storied flats in one of my plot located at the Gulshan No2 sector. The name of the project was ‘Shona Jhora’. I joined in to assist him to complete the project as soon as possible. Six flats would be rent out to make the family sustainable financially and one Duplex comprising two flats would be our residence. The location of the building was of our liking. Lake at the back and infront across the road Azad Mosque, the largest Mosque in Gulshan. I intended to turn my ancestral house at Dhanmandi into a research center on the history of Bangladesh and liberation war under a trusteeship. There would be a library as well. I had a collection of more than 5000 books on different subjects some were very rare. That intention remains to be immaterialized due to adversities up till now! ‘Man proposes but God disposses’. So, I have accepted that as fate accomplee! Stepping on the soil of the country I could feel the heat of a storm on the offing. The ominus dark cloud was visibale at the corner of the political horizon! 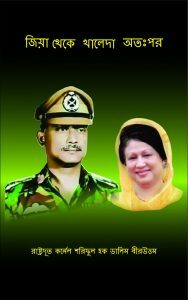 Gradualy Khaleda Zia’s government was getting weaker and at the same time her personal popularity was in the wane. Her ability for good governance and transparency had become questionable and the people at large were disappointed! Besides, the combined movement on the two main issues by Awami Jote, Jamayet and JP, wanton corruption of the Zia family and influential top leaders of BNP, unabated politization of the administration and Judiciary, uncontrolled thuggery, extortion of the Chattro Dal, Jubo Dal and state terrorism against the opposition parties by the law enforcing agencies were contributing to intensify the anti government movement to new hight every passing day. Meanwhile, the creation of the ‘People’s Platform’(Janatar Mancha) by one bureaucrate named M.K. Alamgir with large number of civil servants and professionals joining him with their demands in anti government movement boosted up tremendously the political movement. It was a big jolt for Khaleda Zia and her government became topsy-turvy. Well orchestral saga of Gen. Zia’s ‘Broken suitcase and torn vest’ had already turned out to be a shamefull joke by then due to mega corruption and evil doings of his family members and party stalwarts. On the otherhand the grass root party leaders and workers had become inactive due to inner conflicts and outrageous high handedness and nepotism of mighty Tareq Zia and his cronies at the ‘Hawa Bhaban’. The Ministers and the MPs got isolated from the people for failing to implement the election pledges. The silent majority of the people, mostly nationalists and believer in religious values who had voted Khaleda Zia’a Jote to power got dischanted with the misrule, inefficiency and corruption of the government and the balance was gradually tilting towards the opposition. All their hopes and aspirations dashed to the ground due to greed and lust of power of the rulers. The life had become unbearable for the vast majority. Scarecity and sky rocketing prices of daily necessities had equally affected the fixed income group as well as the middle and lower middle class. Everything was happening under the nose of Madam Khaleda Zia. But she and her jote were totally unconcerned about the gathering storm behaving like an Ostrich and had been enjoying power being surrounded by the psycophants. In such a scenario she wouldn’t return to power in the next election that was the writing on the wall. It happened so in the elections of 1996.